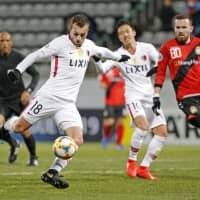 CHANGWON, SOUTH KOREA - Takeshi Kanamori and Serginho struck a goal each in stoppage time as the 10-man Kashima Antlers fought back for an improbable 3-2 win away to Gyeongnam FC in the Asian Champions League on Tuesday. The comeback at a windy and rain-soaked Changwon Football Center keeps Antlers on top of the table as the only undefeated team in Group E.
In Group G, substitute Adriano scored a late winner as visiting Jeonbuk Motors prevailed 1-0 against Urawa Reds, who relinquished top spot to the two-time champions from South Korea in the process. Reigning champion Kashima’s victory may have come at a heavy cost, having lost goalkeeping stalwart Kwoun Sun-tae to a leg injury at the end of the first half. The dismissal capped a forgettable night for Inukai, who opened the scoring with an own goal early in the second half. The defender headed into his own net as he attempted to cut off a cross from former Japan under-20 midfielder Takahiro Kunimoto. 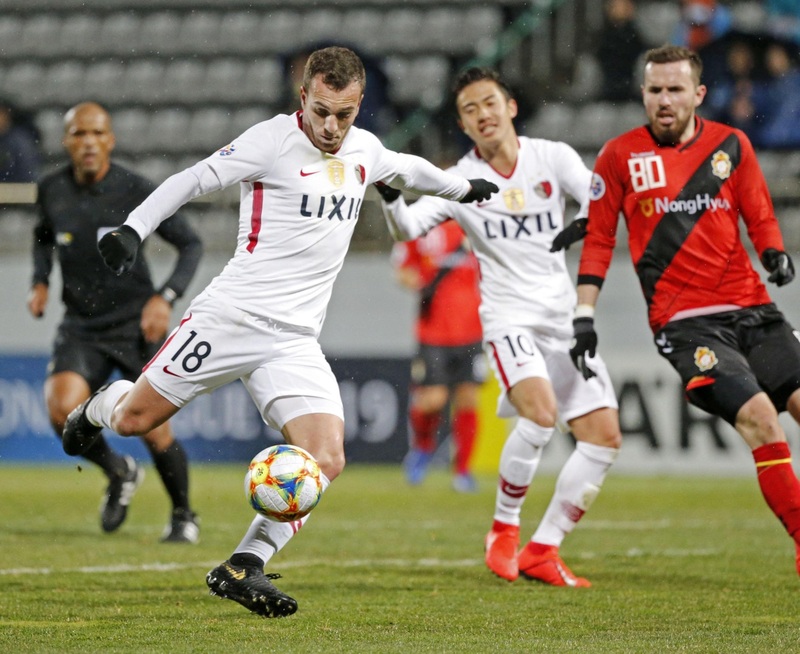 Kunimoto, who joined Gyeongnam last year, helped the K-League side go up 2-0 in the 71st minute, sending a corner kick that former Cardiff City and Crystal Palace midfielder Jordon Mutch volleyed home. Second-place Gyeongnam came into the match two points behind Kashima, which traveled without regular starters Shoma Doi and Sho Ito. Twenty-year-old midfielder Hiroki Abe stepped up in the absence of the veterans, as did Kanamori, who slotted into the left forward spot normally filled by Ito. The visitors halved the deficit with 15 minutes left when defender Woo Ju-sung deflected a Koki Anzai cross, intended for Serginho, for an own goal. Kanamori equalized in the first minute of additional time, scoring from directly in front after Abe headed another cross from Anzai into his path. Serginho struck the winner in the 93rd minute, blasting from inside the area after Itsuki Oda set up the Brazilian forward off a long ball from Kazuma Yamaguchi. Neither team had a shot on target in the first half, but the visitors looked the more dangerous, creating a number of chances while controlling nearly 60 percent of possession. The Antlers threatened late in the half, with Taiki Hirato crossing to Yasushi Endo in front of goal, but the winger’s header was smothered by defender Lee Kwang-jin. Kwoun, one of the heroes Kashima’s victory over Persepolis in last year’s ACL final, was stretchered off at the end of the first half after taking a boot to the lower leg in a contest for the ball. At Saitama Stadium, the clash between 2017 champions Urawa and Jeonbuk looked headed for a draw before Adriano, who replaced former South Korea striker Lee Dong-gook midway through the second half, struck from the center of the area with 13 minutes left. With a win, a draw and a loss, Oswaldo Oliveira’s Reds are second in the group ahead of Beijing Guoan on goal difference.